For those like me, who feel connected to nature and understand the energy and life bundled inside the branches and stems of our gardens, pruning might seem like a harsh and selfish act. Although this is a natural way of thinking at first, it’s important to understand that pruning isn’t all about appearance! Pruning is actually a regular and important part of plant maintenance and encourages overall health and longevity. How exactly does cutting away plant parts help the tree? Pruning away specific branches that are damaged, diseased, or growing in the wrong direction allows your trees and shrubs to focus more energy on their healthy limbs. Removing crossing or erratic branches also encourages your tree to maintain its natural form, reducing stress. Thinning a dense canopy also increases airflow, limiting the risk of pests and disease. Annual pruning allows you to influence the shape and size of your mature plants, ensuring they never grow too big for the overall space. Pruning also keeps your garden looking neat and tidy; with healthy trees and a better curb appeal, it’s a win-win situation! While we know pruning is an essential part of garden maintenance, it can be an overwhelming task that even gardening pros fear. Fair enough; there are various methods of pruning different plants and calendar constraints to abide by and pruning without knowing what you’re doing can be more dangerous to the tree than leaving it untouched. Don’t worry, though – our guide to pruning will have you feeling confident in no time! Before diving into plant specifics, one of the most important aspects of proper pruning is using the right tools. Tools that are dull or too small cause more damage than creating a sharp, clean cut. For the larger branches and thick stems of trees, use a good-sized pair of pruning loppers. 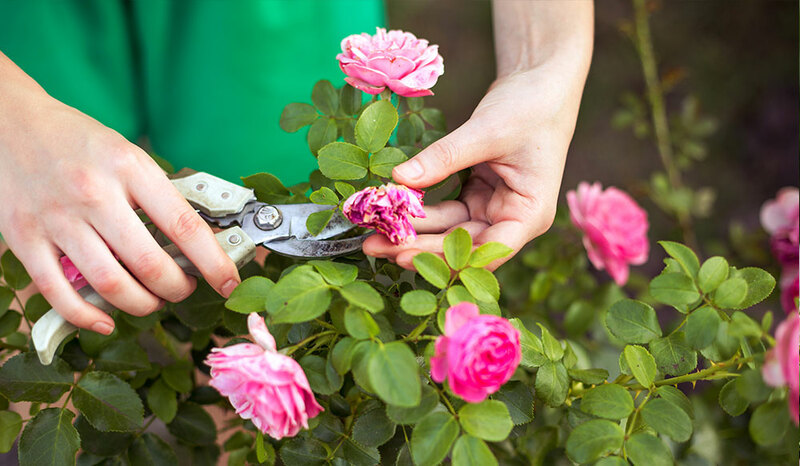 For smaller, softer, and fleshy stems of bushes, herbs, and flowers, we recommend using secateurs (pruning shears). The FELCO line of secateurs has both left and right hand models – which is important for reducing any mashing effect that can prevent fast healing – and has been used by the horticulture industry for years. In fact, I still have the pair my grandfather gave me when I was little! Most importantly, remember to disinfect your tools after use and between different trees. You might not be able to see that a tree has been infected with bacteria or disease, and you want to limit the chances of the disease spreading to the rest of your lovely garden. If you know a tree is infected and are working to remove diseased sections, it’s important to clean between every cut to prevent reinfecting the fresh wood with spores. Though most plants should be pruned annually, this still means multiple trips to the garden with your secateurs, as various plants have different dormancy periods and conditions on when they should and shouldn’t be pruned. Our general rule of thumb is to prune a flowering shrub or tree immediately after it flowers, so you don’t remove the flower buds. However, summer-blooming shrubs, like Viburnum and Potentilla, should be pruned in late winter or early spring, as their flower buds set on new growth. Fall flowering varieties also set buds on new growth and should be pruned in early spring, to give them a good jumpstart to the season. Early spring-bloomers, like magnolias and lilacs, have set their flower buds during the previous growing season, so trimming them early will result in a loss of blooms. Enjoy their marvellous flowers first, and then prune the branches afterwards. However, if your plant is suffering from disease or infection and your options are to prune it or watch it die, always choose to prune. A year without flowers is always the lesser of two evils. Fruit trees and roses should be pruned early in spring so you can see what you are doing and to encourage better airflow through the crown of the plant to decrease the chance of disease. This will also help to open up the crown to encourage more sunlight to hit the fruit, producing a more vibrant and better-tasting crop. Vegetables should also have their leaves thinned on a semi-regular basis to for this reason. Trees that don’t flower are much more open to pruning any time of the year. Unless you are removing broken branches, I would discourage fall pruning – you don’t want your trees using up valuable resources right before they have to endure the stress of winter. Plus, pruning encourages new growth, and new growth likely won’t survive the freezing temperatures. Heavy bleeders, like maples, which leak sap when cut open early in the season, should never be cut in spring. Spring is when these plants are just waking up from hibernation, so their sap will be flowing much more readily than if they are pruned in the fall. Trim heavy bleeders in late August to mid-September just as they are getting ready to sleep once again. Evergreens, like mature cedar hedges or junipers, create their new growth on the tips of the branch. If you cut past the green tips, you remove the living tissue and expose bare spots that won’t grow back. If you do need to trim, it’s easiest to prune from mid-May to mid June when the new growth is soft and fluffy. This way you have plenty to work with, and if your mistakes can grow out, just in case. Of course, there are always some plants should never be pruned, like rhododendrons and Japanese pieris. My general rule of thumb for these plants is if they are growing too big for the space you’ve got them in, you’ve got the wrong plant in that space. Prune your flowering shrubs and bushes according to when they bloom to avoid losing out on this year’s colour. Using your sharpened shears, cut into branches at a 45-degree angle. Starting from the bottom limbs, prune stray branches to discourage unnecessary rubbing that can stress out your shrub. Working your way upwards, remove dead branches and trim for shape. Fruit trees are a little different, with the main goal being to open up the canopy and encourage sunlight and airflow. Remove the diseased, damaged, or crossing branches first, which will naturally thin the tree. Then, continue to cut away branches until they’re all evenly spaced and have at least 6 inches of space between one another. Try not to focus just on what you see at eye-level. Don’t forget the bottom of the tree, where suckers sprout near the roots. Remove these, as they’re using valuable moisture and nutrients that could be going towards your productive branches. Even if your tree is tall, use a ladder to reach the top. Trimming the tops of trees encourages more sunlight to reach the shaded bottom branches. You’ll be rewarded with ample fruits that are easy to reach come harvest time! Tomato plants have a reputation for being difficult to grow and maintain, but that’s just because they grow differently than other vegetable plants you may be used to! When pruning your tomatoes, look for shoots that have begun to sprout from the side of the plant. Like suckers near the roots of your trees, these shoots will hoard resources that could be used to produce more plump and delicious tomatoes. Cut most of them back, especially the ones near the soil, leaving only a three or four behind. The remaining shoots will continue to grow, which will prevent stunting your plant’s overall growth. While you might not think that the basil plant on your windowsill needs much in the way of pruning, it’s actually really important to trim herbs to encourage new growth. The more you pluck their leaves for cooking, the more the plant will strive to produce. I know, it sounds counterproductive, but it works! Maintain tender herbs, like basil, dill, and cilantro, by trimming dead or damaged leaves and blossoms, leaving behind a much healthier plant. Prune them after their flowers have blossomed, starting from the top of the plant. Hardy herbs, like rosemary, thyme, oregano, and parsley, can be trimmed by cutting their stems, an inch above the woody part. Never remove more than a third of your plant at a time, it’s not worth the shock and stress it creates. With the understanding of why, when, and how to prune, you can confidently head to the garden to enhance your pruning skills. If you’re still hesitant, though, it never hurts to ask for expert advice. If a mature plant requires extensive care and maintenance to whip it back into shape, always seek out a specialist. A rejuvenating pruning can take time, but it’s well worth it to spare the years of work it will take to get another plant to replace its size. If you’re still wanting to take a more hands-on approach, we are happy to help! Take a picture of whatever it is you’re looking to prune – now, before the growth returns – and we’d be happy to mark out where to make the best cuts. Of course, we’re also happy to make those cuts for you while you relax on the patio with a glass of wine, knowing your plants are in great hands!